necessary for Operator Certification requirements. 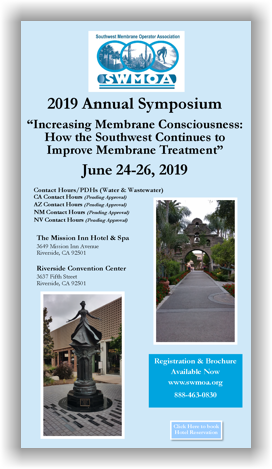 of the Southwest Membrane Operator Association"
The Southwest Membrane Operator Association (SWMOA) is an affiliate of the American Membrane Technology Association (AMTA) and dedicated to the Southwest United States region including, but not limited to Arizona, California, Colorado, Hawaii, New Mexico, Nevada and Utah . SWMOA is a membrane operators group that has been formed to provide membrane operators a forum to exchange information, share experiences and knowledge, obtain training and acquire continuing education credits necessary for Operator Certification requirements. SWMOA is an organization that is for membrane operators, run by membrane operators and has been established to meet the technical needs of membrane operators. SWMOA Membrane Operator Certification MOC-I: Introduction to Membrane Systems Tuesday-Thursday 21 Credit Hours/PDHs (pending approval) Please check back soon for more information. SWMOA Workshop Please check back soon for more information. The SWMOA Workshop was one of the best Technical Transfer Workshops that I have attended. An ambitious schedule of four facilities central to the membrane industry really worked well and gave all the attendees a nice mixture of our industry. Seeing two different membrane manufacturers plants was treat that most operators don’t get to experience.